Darknet tells the story of how private, encrypted, social networks have changed the face of and future of digital entertainment, mostly music, movies, and games. Darknets are unlike the peer-to-peer networks that have been featured in the news and a recent Supreme Court decision in which the content is available to all participants. Rather, darknets are clandestine, more like speakeasies of yesteryear, and often involve more street cred than piracy. The groups that distribute a million copies of Batman Begins in China the day before the movie comes out are only tangentially related to darknet operators and hierarchies. J.D. 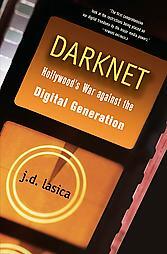 Lasica tells the story in Darknet of the net that has increasingly tightened around the display and use of media in digital form as Hollywood, record labels, and other creative industries have attempted to legislate and criminalize what either perfectly legitimate uses of media or perfectly innocent uses. The body of law that bought-and-paid-for legislators have implemented on behalf comes from a very small number of industries that don't actually drive the economy but do drive campaign contributions. Darknet brings together lots of themes and strands into one clear narrative that makes for good reading and is a thorough introduction. It tied together many pieces for me that I didn't understand from reading many different articles about darknets--no Bush jokes, please, it's a singular concept and a plural set of networks--and the array of copy protection and legal protection in use. My disclosure: I was part of an EFF-driven lawsuit against 29 media companies who were trying to prevent ReplayTV from allowing commercial skipping and program sharing (among one's own machines or household). Lasica's book reveals what I didn't know, that the media companies were trying to prevent SonicBlue from allowing programs to be stored indefinitely and other micromanagement of perfectly legitimate personal uses. Lasica hits the point over and over again that there is a large group of people, largely young folks, who given the opportunity to pay a reasonable market rate for content in a form they can use would gladly do so. This doesn't excuse piracy and copyright violation, but it does excuse the desire for legitimate use of material that all of the new and Hollywood-driven protections prevent. All in all, Lasica finds reasonable experts and industry folks across a wide spectrum who are seeing already a huge explosion of creativity when new tools are put in people's hands to tell their own story and stories of other people. If the law winds up being too onerous and the ultimate example--a digital camcorder shuts down when you're recording a toddler's first steps because a Disney show is playing remotely in the background--comes true, then you'll either see a deadening of culture or a rejection of mass media.